The single malt Scotch, The Macallan 1962 from its Fine & Rare collection, not only shares its year of inception with Bond on the big screen, but also features on its label the signatures of Daniel Craig (James Bond in SkyFall), Javier Bardem (who played villain Silva) and Bond Girl Bérénice Marlohe. In the film, Silva treats himself and Bond to a glass of The Macallan 1962 during the deadly shootout on his private island. The auction will take place in London at Sotheby's on April 17, as part of The Macallan's Finest & Rarest Wines sale. All proceeds from the auction of this lot will go to the Government Communications Fund, which supports former and serving members of GCHQ facing hardship. Ken Grier, director of malts for Edrington, owner of The Macallan, said: "Following on from The Macallan's appearance in SkyFall, we are delighted to further our association with the Bond franchise with this charity auction. "We are hopeful that the combination of the Bond link with the auction appeal of vintage Macallan will give us a great result. The Government Communications Fund is a very fitting recipient of the monies raised." Founded in 1824 in Speyside, The Macallan is one of the world's most awarded single malt whiskies and currently holds the Guinness World Record title of the most expensive whisky ever sold at auction. In 2010 The Macallan 64 years old in a Lalique Cire Perdue decanter was sold for $460,000 (£290,000) in New York, all of which was donated to charity. 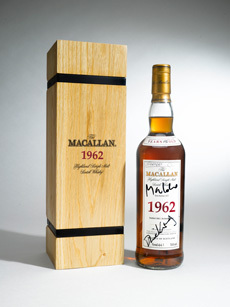 The bottle of Macallan 1962 sold for £9.635 (approx. $15.000 or €11.000) on the April 17th auction.